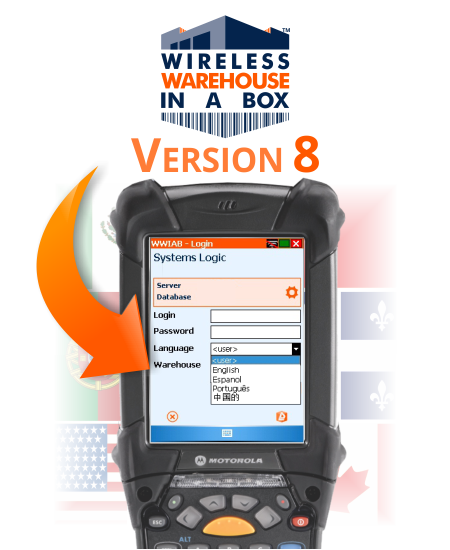 Wireless Warehouse In A Box™ Version 8 Release, Includes Multi-Language! Recently, the Systems Logic team released version 8 of their Warehouse Management Software, Wireless Warehouse in a Box™. In this version, we are delighted to announce that it now includes complete multi-language capability on the mobile devices. This new feature will permit all warehouse associates to work in their native language! As a leading warehouse software provider, Systems Logic continues to compose and launch intuitive management technology. As a team of warehouse experts who’s prime goal is to ensure customer value, we strive towards delivering the cutting edge of products and service to our clients. In addition, Version 8 has been completely redesigned in order to provide you an enhanced user interface using detailed icons and clear, concise information to streamline user recognition and acknowledgement.